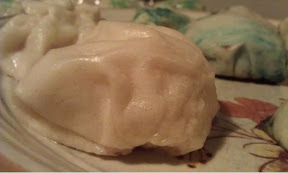 At 4:30 this afternoon I decided it would be as good a time as any to start making Chinese Steamed Buns from scratch. I've been thinking about trying them for weeks and I finally decided it was time. 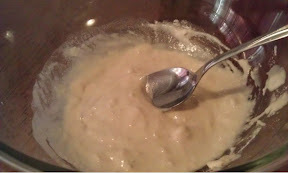 So I got to mixing the "sponge" which is basically the yeast, some water, flour, and sugar. 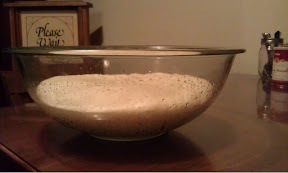 After the sponge sat for 30 minutes I added the rest of the ingredients and kneaded away until everything was ready. 2 and 1/2 hours later, voila! Now the recipe is supposed to make 24 buns, so I decided I would try and make four sets of six, each with their own color and filling. 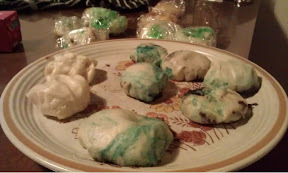 Adding the food coloring seemed genius at the time. 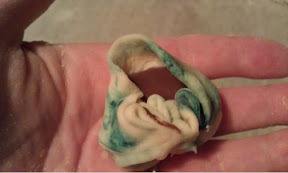 There would be adorable colorful swirls and the buns would look cute! I'd watched a video earlier in the day about wrapping and sealing the steamed buns. Looked easy! None of mine really came out as nice, but at least I got a lot of practice in! I ended up with quite the assortment of buns. Orange ones were stuffed with pizza ingredients (sauce, cheese, meat), green I stuffed with all the random veggies I could find, blue I tossed Nutella into and the plain ones I left plain. The first few I steamed stuck to the steaming plate and tore open, oozing pizza sauce everywhere. I'm also positive I rolled the dough too thin. Nearly all of the buns leaked slightly in the steamer. 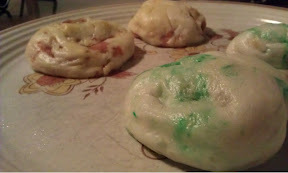 By the time I got toward the end of the buns the dough was getting hard and the buns had gotten stuck to the parchment paper I'd placed them on. I think they needed to remain covered the whole time while waiting to be steamed. 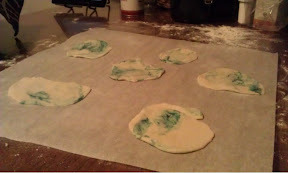 I also probably should have used more flour to prevent them from sticking. Somethings to remember for next time. Since my larger steaming plate is in the storage unit, I used the rice cooker's. Doing it that way I was only able to steam four at a time for 15 minutes. I was finally finished a little after 11pm. Anyway, they were tasty even if they were not the most beautiful creations. I've got plenty to toss into the fridge and freezer. 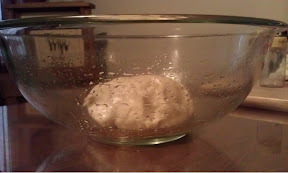 Next time I'll just have to remember to start earlier and to not roll the dough so thin.